I meet up with Martin La Roche again. 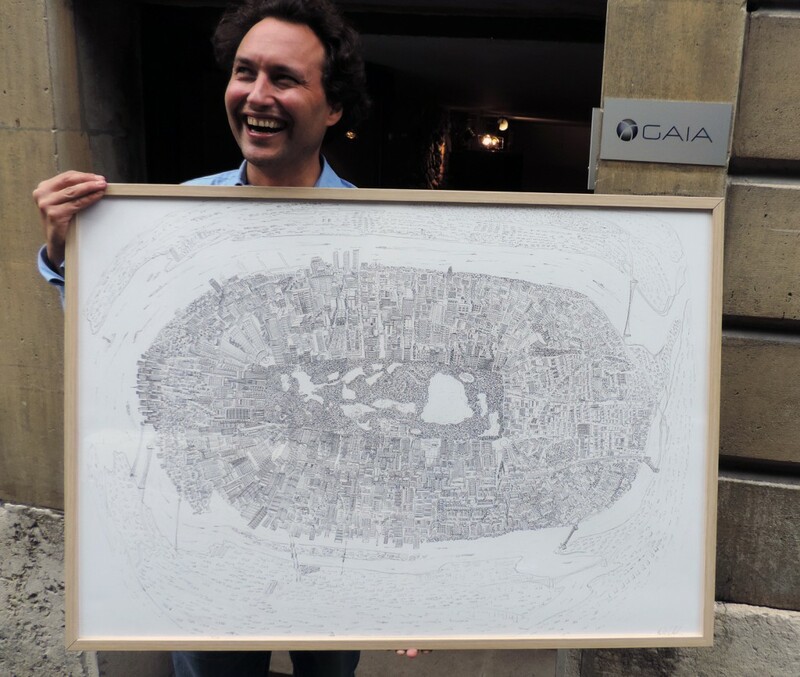 His ready smile reveals his continued enthusiasm for and commitment to his minutely detailed satellite-view cityscapes. Since our last meeting he has gone international. I find him setting up a new exhibition – opening Thursday 10th October – at the discrete and welcoming Espace Gaia in Geneva’s old town. I remain mystified as to how he produces these drawings. 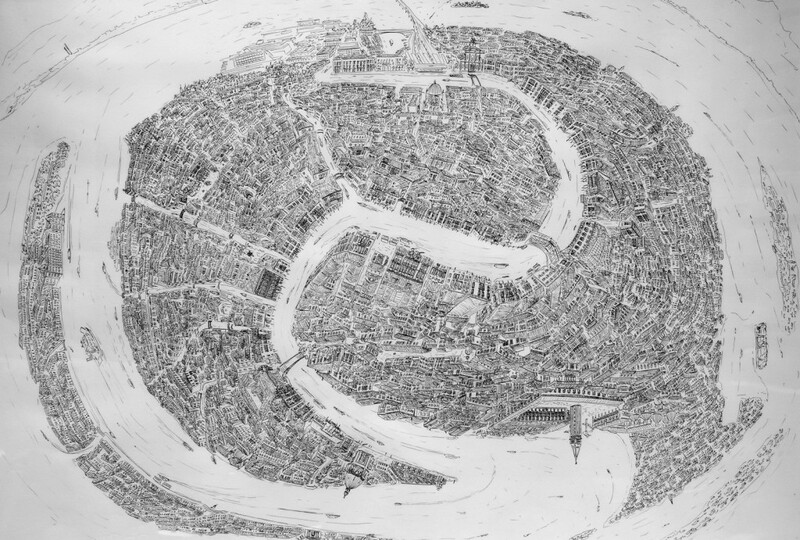 He uses maps and web-based aerial images for reference but his ability to imagine the views that he then draws is astonishing. Take a closer look! In “Manhattan” he gets away with depicting the Guggenheim Museum upside down! One of his favourite travel destinations is Venice. 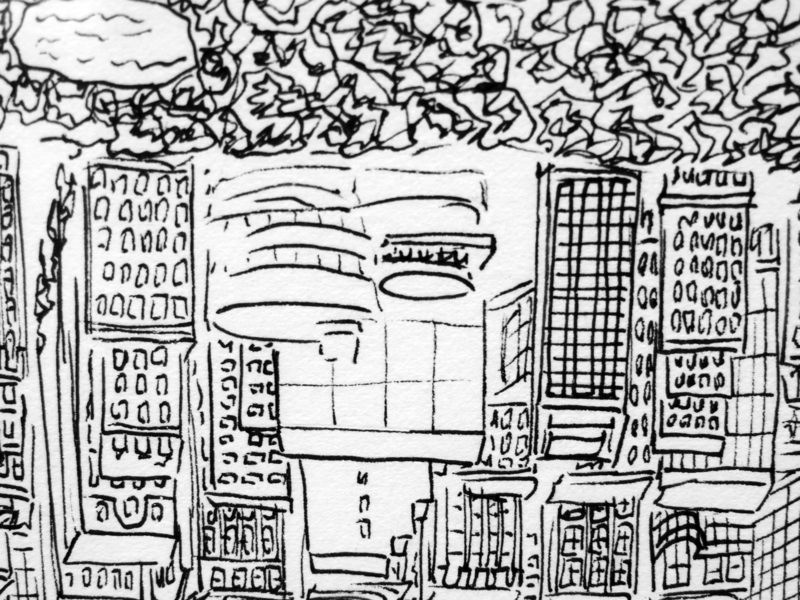 He has drawn the city in his unique style and in doing so evoked a yingy-yangy thingy at the same time. Very cool! Espace Gaia is at 14 rue Calvin, Geneva (old town). I will never have the opportunity to meet James Rizzi. He died at the age of 61 in 2011. This saddens me. Having discovered some of his last remaining work in Europe at the Galerie I.D in Geneva and having done a little research, I know I would have really liked the guy. His output was prodigious. On-line photos show a mischievous smile. His beautiful stuff makes me happy. 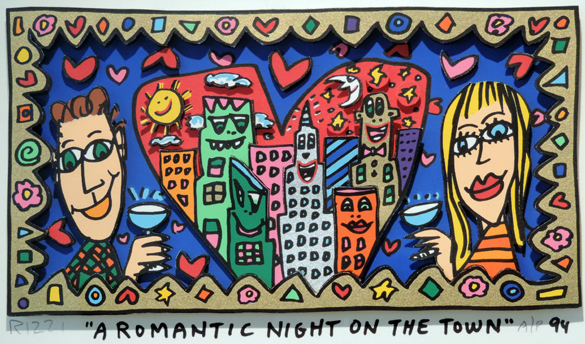 “A Romantic Night on the Town” by James Rizzi, 1994. 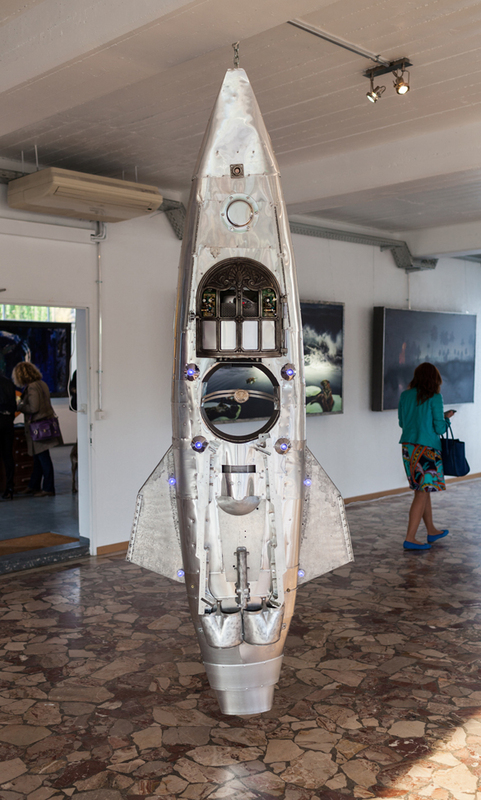 Image thanks to Galerie I.D Geneva. I love the way the buildings in his jumbled cityscapes are colourful characters themselves who observe and find amusement in the mass of colourful human characters. And the detail! In “Living Near the Water,” little green men arrive by flying saucer as yet unnoticed by the heaving crowd. The buildings are happy. The people are happy. The sun is happy. The moon is happy. Humanity is crammed down by the water’s edge or into boats. But we’re left with the feeling that there’s something off-stage. What is the event that has brought such a crush of people and the simultaneous arrival of the aliens? 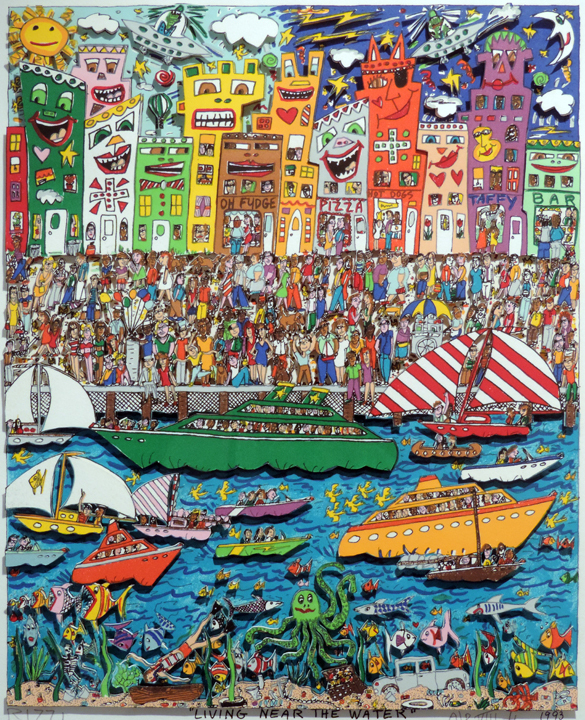 “Living Near the Water” by James Rizzi, 1993. 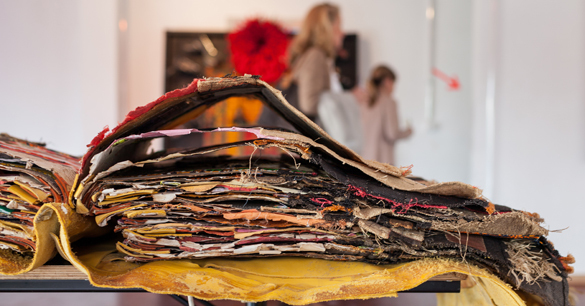 Image thanks to Galerie I.D Geneva. 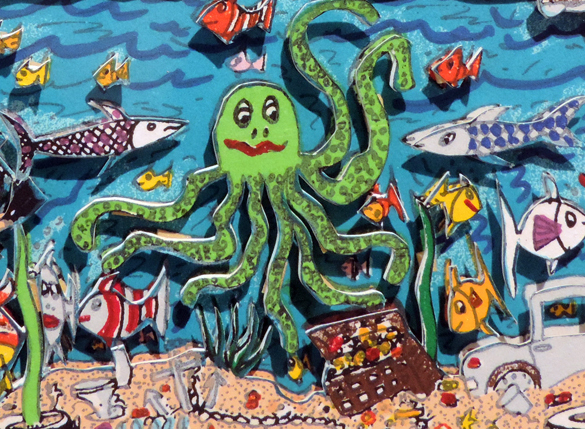 A big green octopus guards a treasure chest on the sea bottom. You could look at this for hours and never discover all the little laugh-out-loud passages. Detail of “Living Near the Water” by James Rizzi, 1993. Image thanks to Galerie I.D, Geneva. In 1997, Rizzi was appointed the official artist for the Montreux Jazz Festival. His poster for the event is a masterpiece. 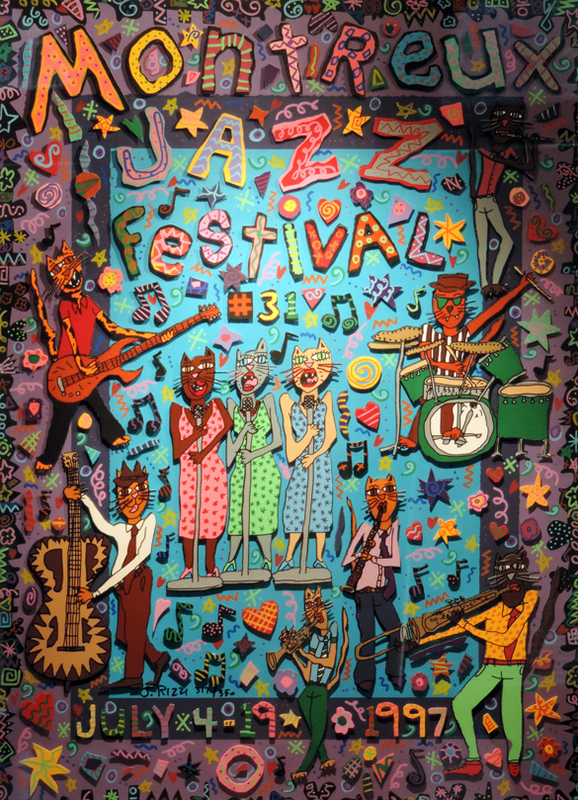 Poster for Montreux Jazz Festival 1997 by James Rizzi. Image thanks to Galerie I.D, Geneva. 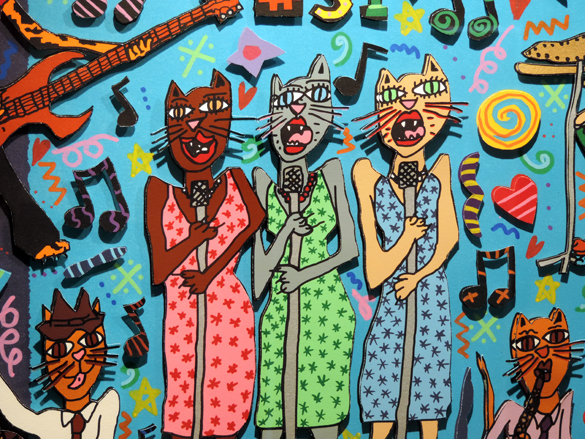 I adore the three cat-back-up singers. You can almost hear them! Deatail of Poster for Montreux Jazz Festival, 1997 by James Rizzi. Image thanks to Galerie I.D, Geneva. 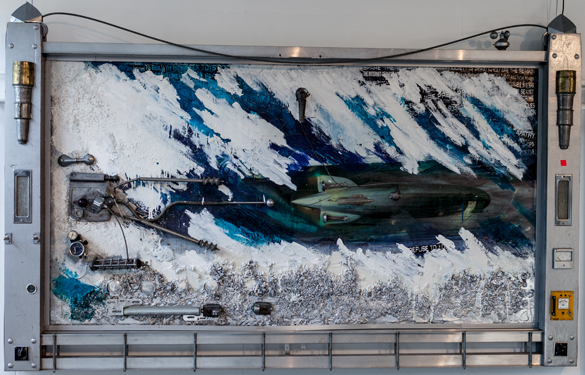 In his inimmitable style he painted a Lufthansa jet, a VW beetle and whole buildings. In 2008, he won a commission to design stamps for Germany. No problem guessing which one of these three gents is Rizzi! 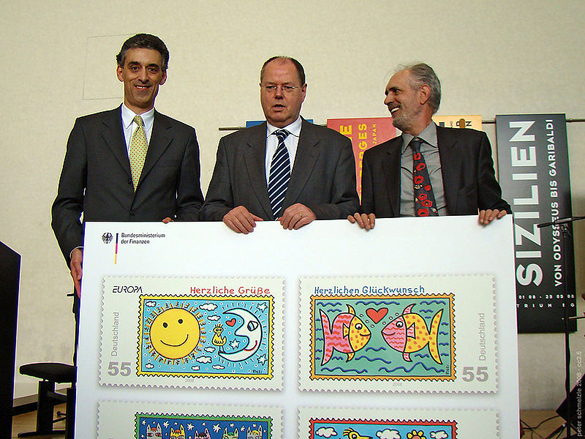 James Rizzi (on right) at the Inauguration of his German stamps in 2008. 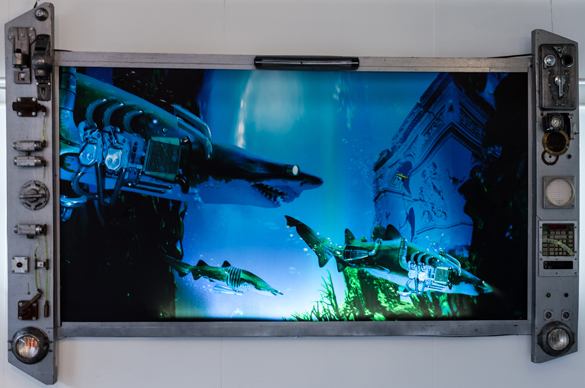 Image copyright: Peter Schmelzle. But my favourite is “Visit My Friendly City.” It amuses and intrigues. Again, we have the characterful sky-scrapers and the little green men in space ships. But what is Rizzi’s humouristic off-stage story here? Why are the buildings all showing such anxiety (except the cool-cat-building)? Do they know that the aliens will not, like tourists, find the city quite so friendly? 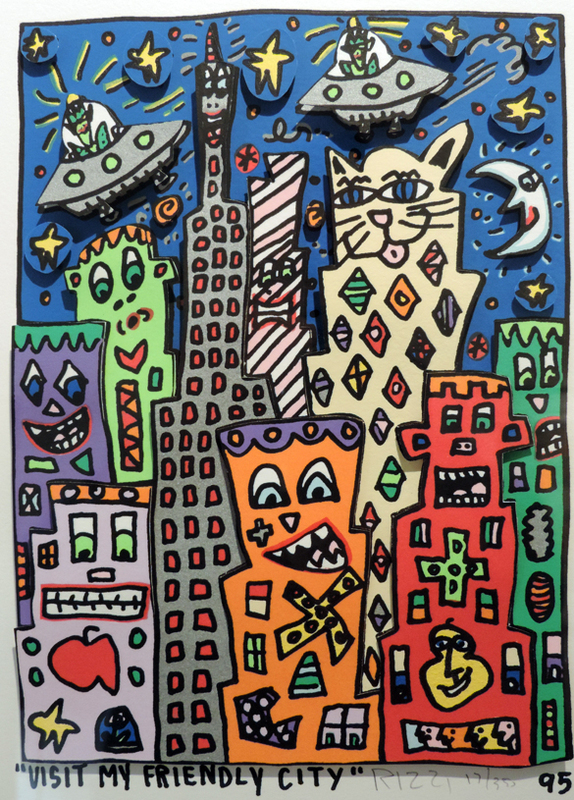 “Visit My Friendly City” by James Rizzi, 1995. Image thanks to Galerie I.D, Geneva. In 2006, Glenn O’Brien wrote about Rizzi: “His merry maximalism and delight in delirious detail and elaborate minutiae created a true art brand, a trademark style as recognizable as any in the world.” Although I’ll never discover James Rizzi in person, my visit to Galerie I.D was a delightful discovery of his so instantly recognisable beautiful stuff. The print measures 25 x 35 centimeters. It includes both textual and graphic elements. The centaur, wearing a student cap, looks happy. Like many students approaching the light in the end of the tunnel, he probably had a few (well deserved) drinks. Lunds Studentkårs Karneval is a student carnival taking place in Lund (Sweden) every fourth year. Dating back to 1849, each carnival has a different theme, featuring shows, food and drinks. 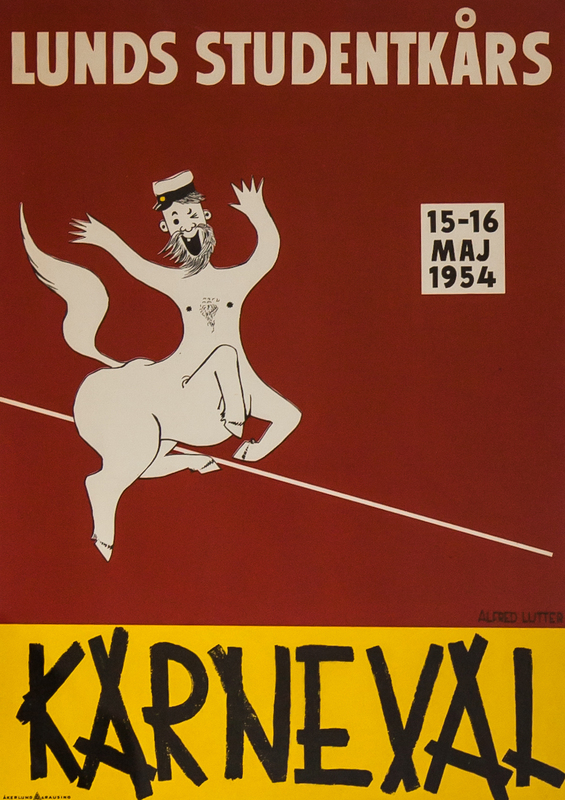 This is the original poster of 1954 carnival. Feel the tide of history! The print is signed “Alfred Lutter.” Google tells me this is actually an anagram of Hans “Hasse” Alfredsson and Carlgösta “Lutter” Wistrand, both studying at University of Lund 1954. The former (pictured to the right) is today a legendary Swedish actor, director, writer and comedian. The print is now framed, hanging on a wall in my home here in Geneva. It reminds me of my Swedish roots, as well as of the excitement, anxiety, joy and pain of being a student. And how I love the work of Hasse Alfredsson. This is absolutely priceless.